Although I had previously written a fairly detailed post about the Jones Bridge and its predecessor, the Bridge of Spain, I have recently come across certain information that warrants a separate posting. I feel it is rather significant and fell upon it by chance through one of my readers. Well, as you can imagine, this short comment fired up my historic senses ! I knew that the Filipino architect, Juan Arellano, designed the bridge but now I find that there was someone else who had designed the beautiful sculptures. I needed to investigate further. I emailed Mr. Beattie for more information. He replied that he thought one of Mr. Credo’s sons was living in Italy but alas, he had no contact information. Once again, luck played its hand. I received an email from another reader, Rain Paas, who kindly provided me contact information for the Fischer-Credo family. Excitedly, I felt I was getting close and things were beginning to fall into place. 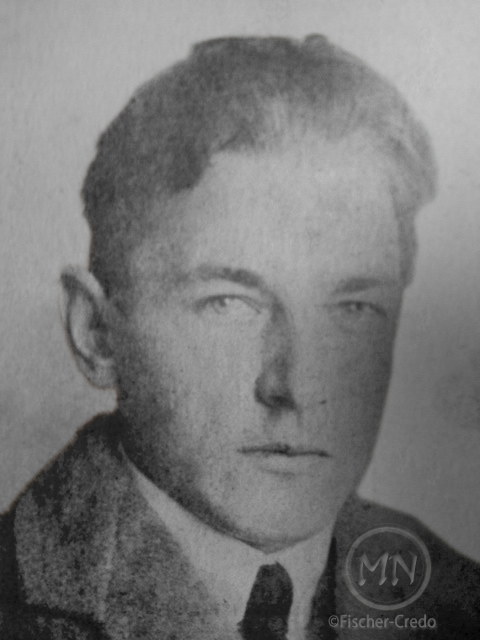 I contacted the Credo family, hoping they would have any photos or drawings of their father’s work. They responded and were very gracious and generous to provide the very rare photos I’ve posted below, following a brief history of the construction of the Jones Bridge. 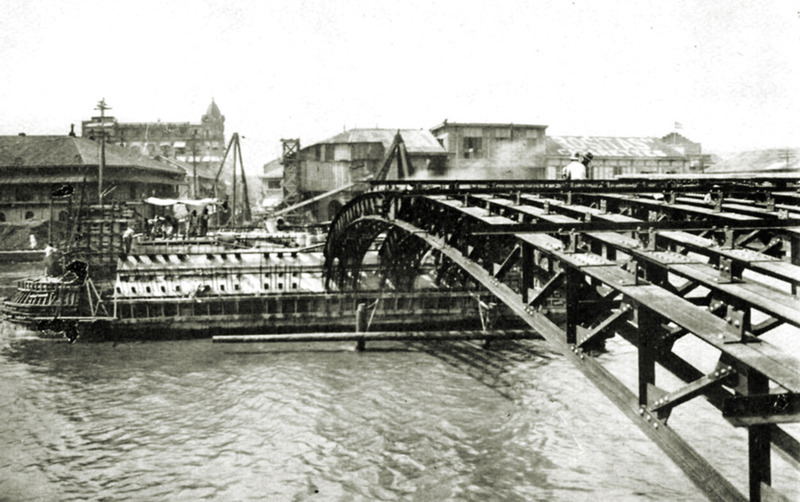 In 1916, Juan M. Arellano, a member of the Bureau of Public Works, was commissioned to design a new bridge to replace the Bridge of Spain damaged by typhoon and floods in 1914. 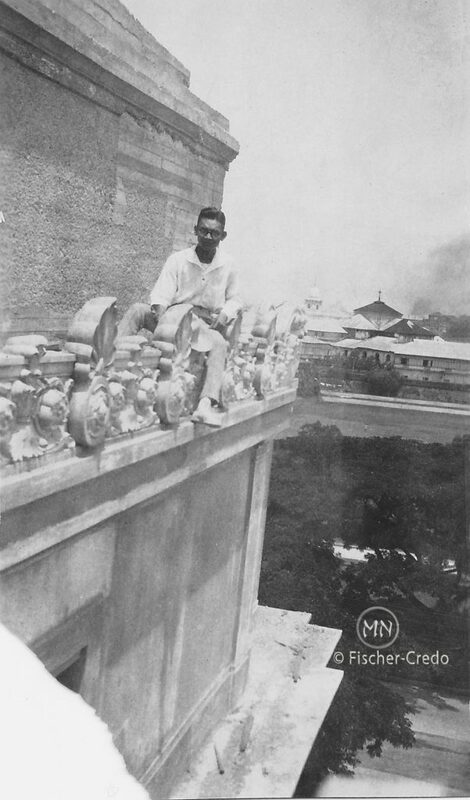 Note: Juan M. Arellano was also responsible for designing the Manila Post Office, the Legislature Building, and the Metropolitan Theater (see his story on my post of the Manila Post Office). Temporary repairs were made to the old bridge which continued to be used for nearly 5 years, but it was clear a replacement was needed. 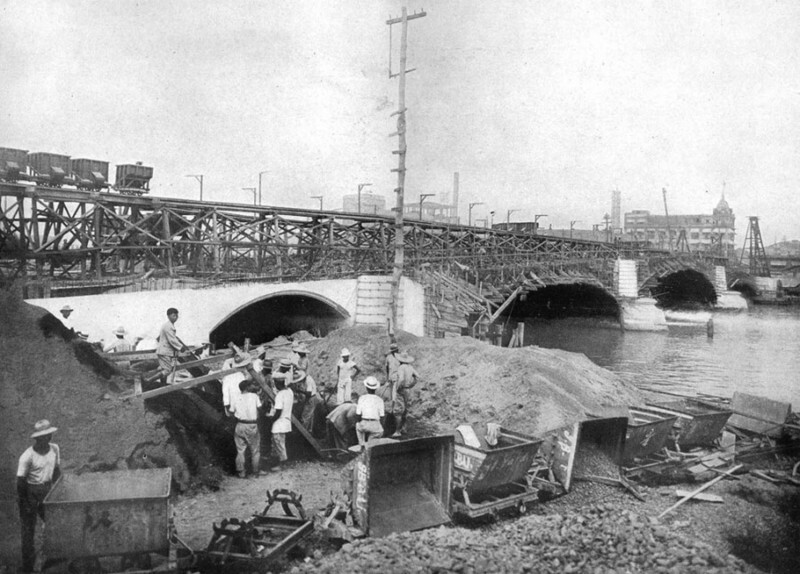 Construction was started on a neoclassical reinforced concrete arch bridge from Plaza Lawton next to the Post Office, and span across the Pasig River over to Calle Rosario, just west of the original site of the Bridge of Spain. 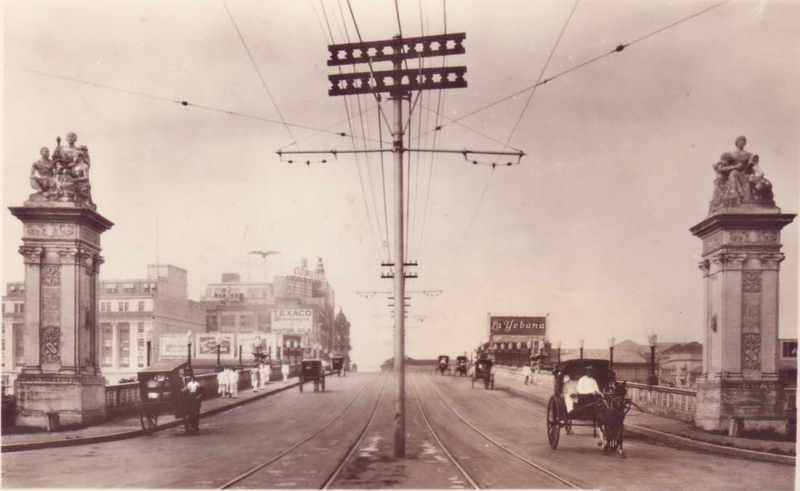 Construction of the bridge was supervised by the Bureau of Public Works, thrown open to vehicle traffic on August 22, 1921, and commissioned in December of 1921. During this time, another artist was commissioned to design and build the statues that would embellish both ends of the span as well as in the middle support. This project fell to that artist, Otto Fischer-Credo. Otto Fischer-Credo was born in Berlin in 1890 and died in Vancouver in 1959. He studied at the Akademie der Kunste in Berlin from 1908-1915 and the Royal Academy of Art in Paris from 1919-1921. Fischer-Credo lived in the Philippines, Mexico, Cuba and the United States before settling in Vancouver, B.C. in 1957. 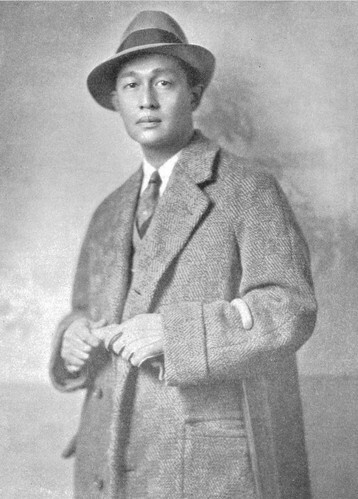 His first solo show was in Manila in 1926. Apparently Otto and his wife, Astrid, had lived in Berlin in the 1920s but traveled the world, living in Mexico, befriended by the artist, Diego Rivera, as well as doing commissions in the Philippines and Cuba. During WWII, he was conscripted into the German military to work as a war artist glorifying the Third Reich. Both Hitler and Himmler sat for him in which he produced their sculptural portraits that were placed in government buildings which were destroyed during the battle to liberate Berlin. 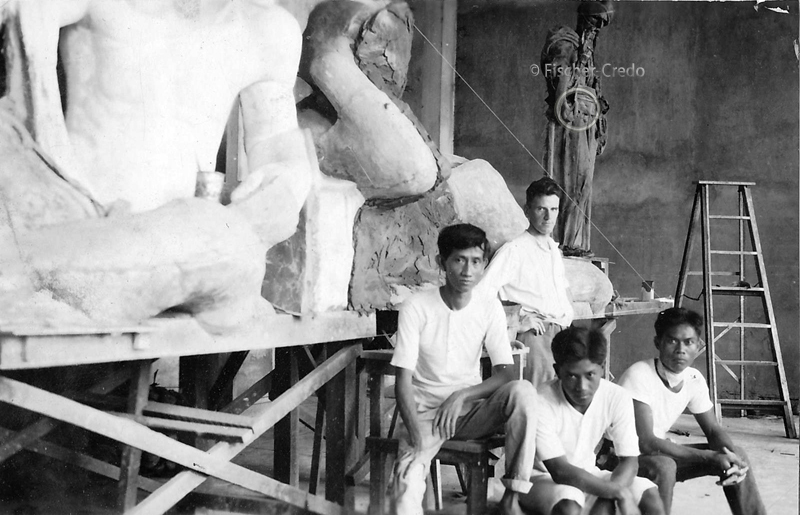 This was taken inside Otto Fischer-Credo’s studio showing a sculpture in progress along with his assistants. 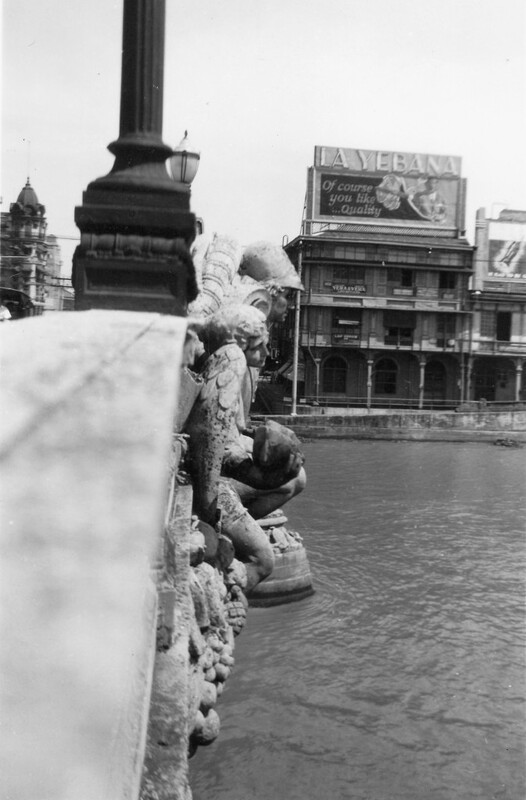 As I perused the family’s photos, I was quite surprised to discover that Otto was not only responsible for the decorative sculptures along the side of the bridge but the four large sculptures at each of the four corners of the span, including the famous, La Madre Filipina. 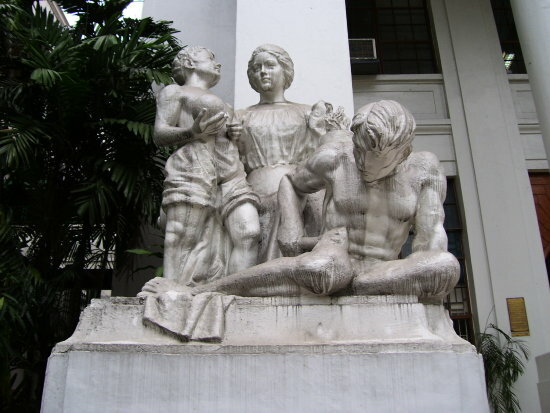 Research credits these sculptures solely to Filipino artist, Ramon Martinez so I will caution that my facts need to be corroborated. However these photos, clearly shows the work in progress at Fischer-Credo’s studio. I can’t be certain but that may be Juan Arellano in the background. The photo below shows what may have been one version of La Madre. I noticed little changes such as the bird in the girl’s hand is gone from the final version. Three of these statues survived the war. 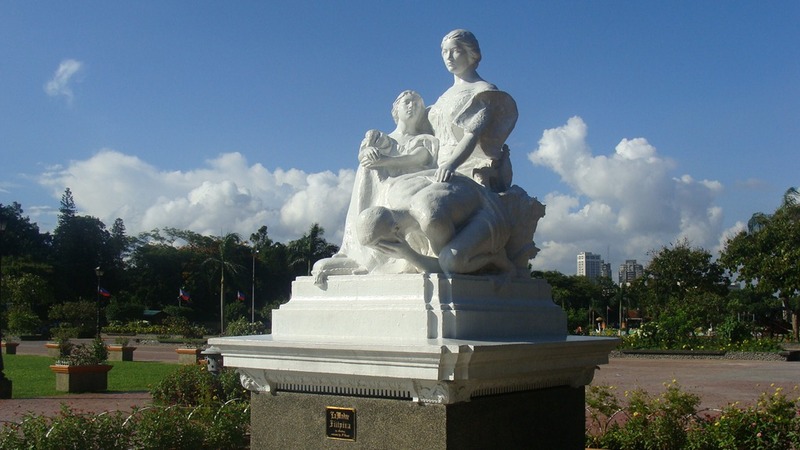 La Madre Filipina was later moved to the Luneta (Rizal Park) close to the Rizal Monument. The other two now stand in front of the Court of Appeals. The collaboration between Juan Arellano and Otto Fischer-Credo continued with the design of the Legislative Building (now Pambansang Museo). 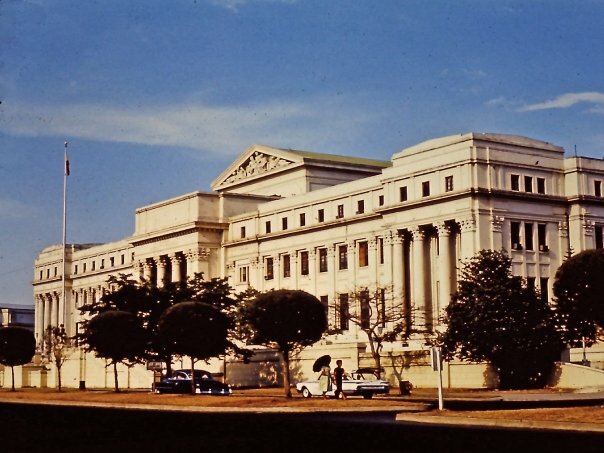 The building was originally designed by Ralph Harrington Doane and Antonio Toledo in 1918, and was intended to be the future home of the National Library of the Philippines, according to Burnham’s Plan of Manila. Meanwhile, a Capitol building for the Philippine Legislature (established on October 16, 1916) was to rise on Wallace Field, just south of the library (the location is now María Y. Orosa Street in Rizal Park). 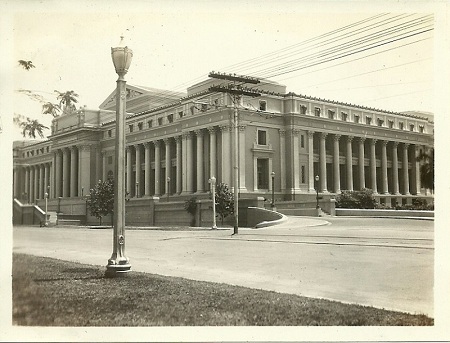 Instead, the Philippine Legislature decided to move into the Library building in 1926, and changes to the building’s layout were done by architect Arellano. 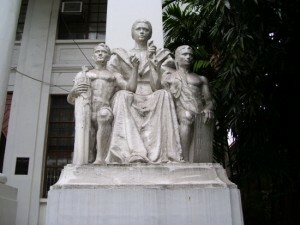 The Second Regular Session of the 7th Philippine Legislature was formally opened at the building on July 11, 1926. 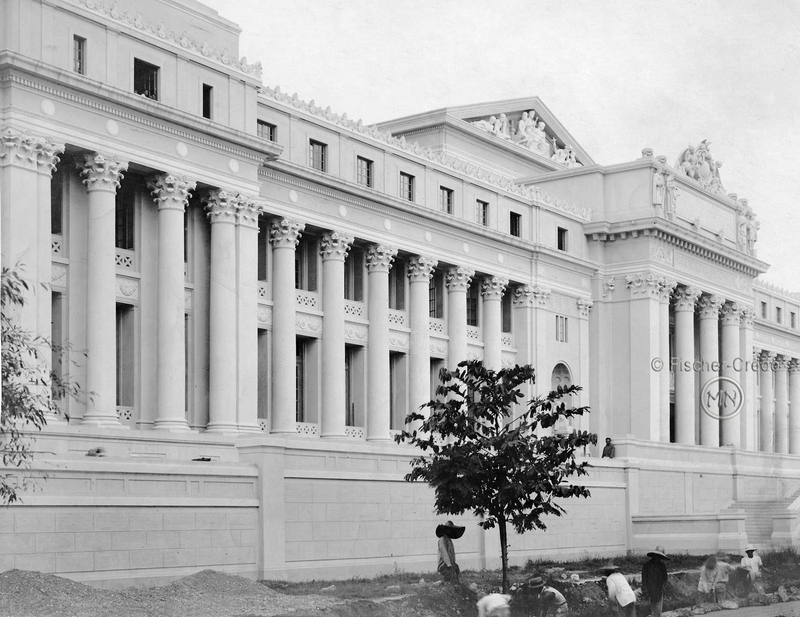 It was concurrently the headquarters of the National Library from 1928 to 1944. The sculpture of Mercury still inside Credo’s studio. The little girl is not identified. 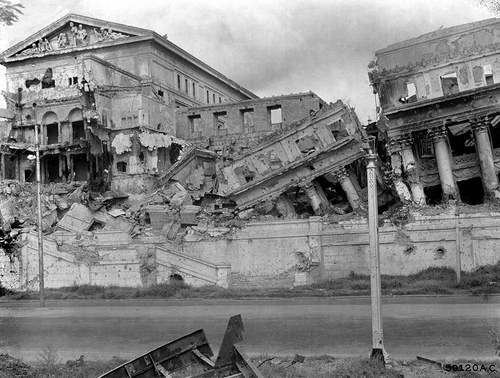 Unfortunately, this magnificent building suffered extensive damage during the Battle of Manila. The building was restored and some of the Credo’s sculptures saved, however, the “newer” restoration seems to have lost the elaborate embellishments and grandeur it once had. I hope you have found this bit of architectural history interesting. I found it fascinating to say the least. Thanks to Mr. Beattie, Mr. Paas, and of course the Fischer-Credo family for their invaluable assistance. We had to cross the Jones Bridge to get to my father’s office at C.F. Sharp & Company. I wish I had paid more attention to the sculptures on the bridge! Thanks for researching this piece of history Louie! Noel, the sculptures on the bridge were removed when the Jones Bridge was rebuilt after the war so you wouldn’t have seen them. We were left with a “new” Jones Bridge totally lacking in style and grace. Good one,Lou. I never saw them either! Wonderful as they were beautiful. Now do you have images of boats crossing the river under these bridges at that time? These are great! Hi Lou, thank you very much for getting this story out. I’m a “fan” of the pre-war Jones Bridge and Legislative Building. It’s sad that these weren’t reconstructed to the level of grandeur these had before the War. I believe the Jones Bridge deserves a restoration of its neoclassic appearance. Thank you for sharing this very informative document on the splendid examples of Manila’s neoclassical structures. The prewar Jones Bridge and the Legislative Building are arguably the quintessence of US neoclassical architectural design in what must have been a marvelously attractive city. the photos and history was great…more power to you…could i share the photos and part of the history with another group i belong to? >old manila…. Of course you may share. Please give credit to the Fischer-Credo family as the photos are copyrighted. Thanks ! I remember crossing this bridge ( for my commute) during my college days at PNC. 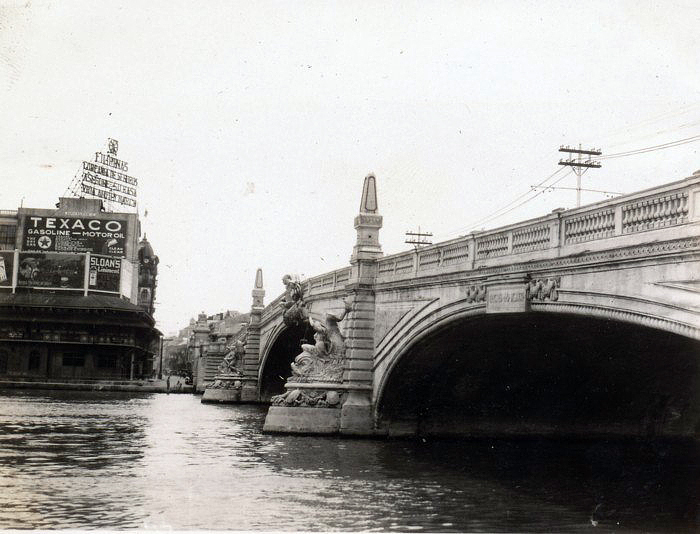 Did they restore the Metropolitan Theater across the bridge? I believe it is near the Post Office. Thanks for sharing! The Metropolitan has gone thru a couple of half-hearted renovations but it still stands empty and in disrepair. I do hope it will be thoroughly renovated one of these days like the Luneta Hotel recently before someone decides to tear it down and put up a parking lot. Alas, the Jai Alai building suffered that fate. Congratulations for this great article. You were able to gathered so. many valuable information that are not readily available. Thank you and more power Lou. What a find! This article is definitely for the books. In light of this, can we somehow feature some of the photographs along with the descriptions on these to be featured on our fb page, Philippines, myPhilippines? I’m sure this would benefit all that have interest on this subject of the Jones Bridge. Thanks and more power to Manila Nostalgia! 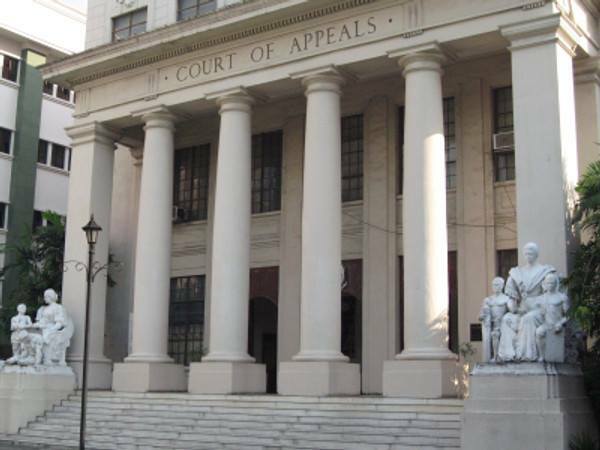 For almost three years I climbed up and down the steps of the Court of Appeals main building without knowing the provenance of the two sculptures on either side. I’ve always admired these figures, sentinels that stood guard at the court. Thank you, Mr. Gopal for this fascinating piece of history. I do hope to hear more from your site soon. Thanks for the great job you are doing to help us keep in touch (and more) with our roots. Just wanted to mention my father Alfredo Carmelo who was the first Filipino pilot and one of the better known painters specializing in marine and bullfighting. His father Eulalio Carmelo y Lakandula founded Carmelo & Bauermann one of the more important printing houses together with his German partner William Bauermann. I live in Barcelona. Spain and have been away since 1964 but could try to get you photographs if you decide to publish something about this. Thank you once more and please keep up the great work you are doing Lou. Would you know who did the reconstruction of Jones Bridge, post-WWII? Kudos! These are great historical information that are not found in our library books. Now I have a better visual understanding and appreciation of those sculptures that made the prewar Jones Bridge a beautiful structure of art. Otto Fischer-Credo is from now on a name attributed to the history Jones Bridge. I hope more pictorial records and photos would surface so that our generation would get to see, at least in pictures, this historical structure forever gone. Thank you for the walk through history. As a side note, the Legislative Building now houses the National Art Gallery, which is part of the National Museum. More galleries were still under development as of May 2014. Hi Noel, well they do look quite similar. That photo was taken in Credo’s studio but I can’t verify if that was his work. There may have been other artists collaborating with him. Thank you for sharing. I am Otto’s granddaughter and it was amazing to see the pictures of his work and know his story is being shared. Great job!!! Thanks for all your hard work. This and the other articles are very inspiring and interesting. I’m an architect here in Seattle, and I wish these historical facts and details can be compiled into an architectural history book or some digital form and used in schools throughout the Philippines and maybe inspire more people to restore and preserve some of the remaining architectural treasures in the country. Do you know if such a book exist? I’ve always wondered why they did not restore the bridge to its original design using the original piers. Yes, those places are not mere aesthetics. They play a part in our intellectual and emotional development, as you have went through as kid, and even up to now. They are a source of emotional security and can reinforce the sense of self. So sad that some short-sighted people (mayors/developers) didn’t see it that way. Those landmarks are precious and have a “sense of place”. Cheers! I’m so happy to be of a little help to find the Fischer-Credo’s in Italy. I had contacts in Rome who helped me with this. My heart bleeds for this destroyed bridge. 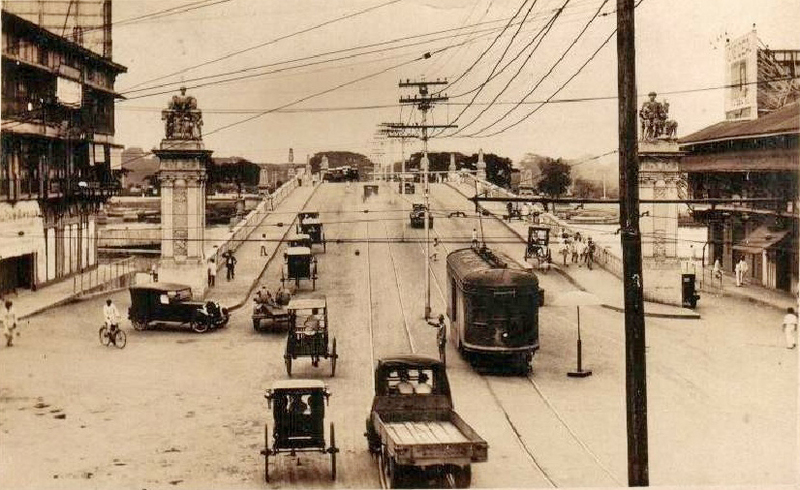 I was born with jones bridge already reconstructed and this photos just shows and is evident of how truly beautiful the Manila that was destroyed by the war. Thank you Lou for doing the rest of the research and posting these. Thank you Rain for your invaluable help in contacting the Fischer-Credo family. This never would have happened without you. These articles I have written have all been written with the help of interested historians and family members who have written to me offering their stories and photos. I’d like to take this opportunity to thank them all ! Hi! This is a wonderful post. I was, for so long, wondering who was the “Martinez” ascribed to the La Madre Filipina in Luneta. And you gave the complete name–Ramon Martinez. So have you already confirmed if it was Martinez or Otto Fischer-Credo (or both) who did the La Madres? 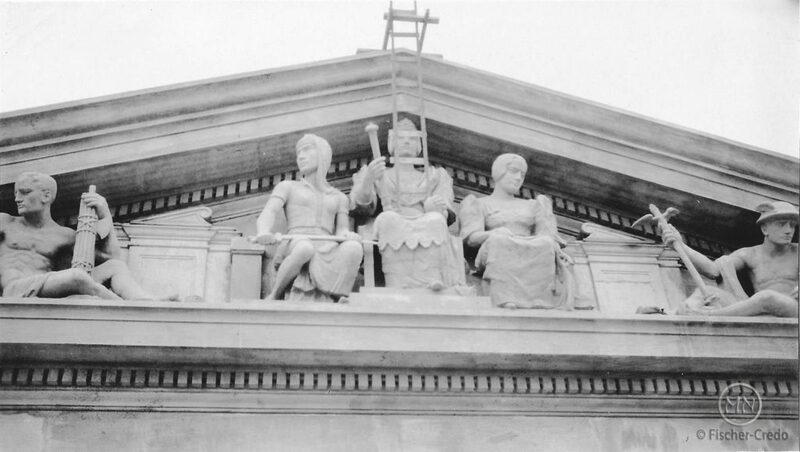 Also, it was not clear to me in the post if it was also Fischer-Credo who did the allegorical and mythological sculptures at the pediments of the National Museum (old Legislative Building). All the while I thought they were Isabelo Tampinco’s work. Irvin, alas nothing has been confirmed other than seeing the sculptures in Otto’s studio which to me proves he worked on them if not designed them. There was the one La Madre in his studio – the photo is included in the article. I suspect these and the Legislative Bldg. was a collaborative effort but records documenting Otto’s role in the project are now gone. I am sure he was with Arellano in Pennsylvania Academy of the Fine Arts I found his class card in one of his books and a receipt of the book which he bought in a PA bookstore. 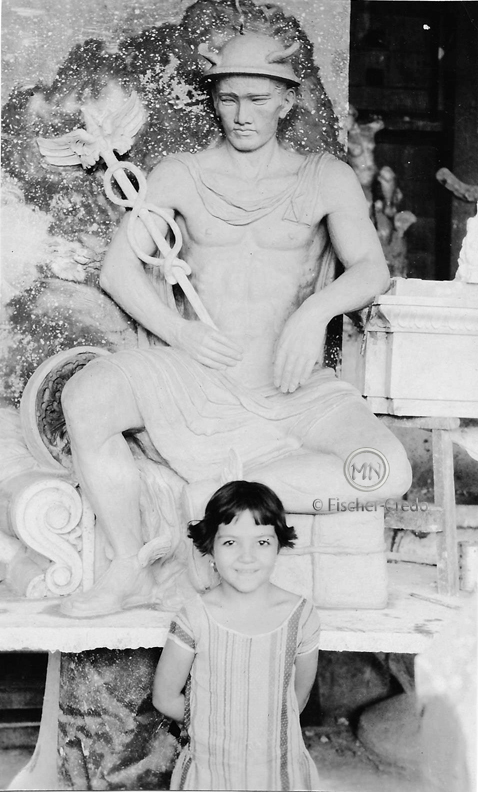 My grandfather Gregorio is a sculptor and painter, I’ve seen a lot of his sketches,scale model of the Siamese Dancer and detail sketches of the Deco ornaments used in the Theater façade. I want to know more about him and his involvement in these great architectural works which I have seen and grew up with in Manila. 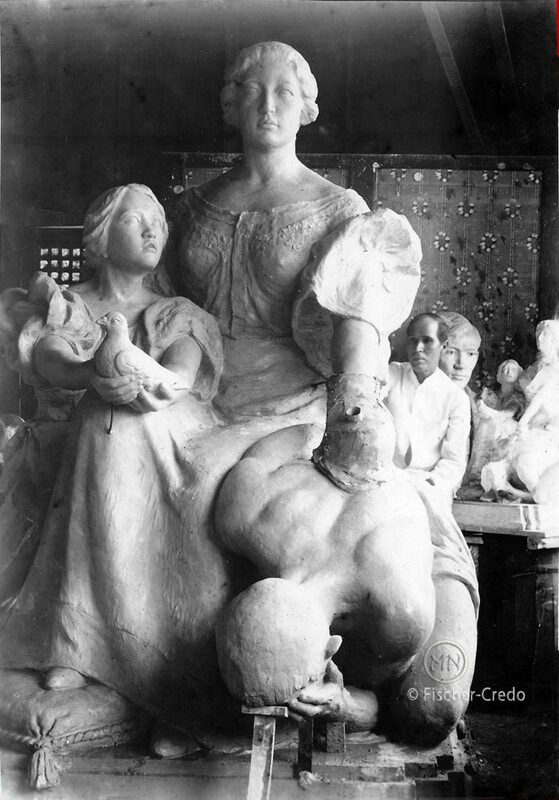 I noticed that at the 11:09:08:23 mark, there was a close-up of one of the statues (the Intramuros side), the “La Madre Filipina” in Rizal Park. I noticed that in the matron’s outstretched left arm (over the back of the huddling male figure), her hand is holding something long (rod? scepter? thin scroll? ), which is now conspicuously absent in today’s statue. Do you think it might be a prior modification before the final version, like in the provided picture by the Fischer-Credos? In the clip, besides the rod/scepter, I can see something like a bird. What are your thoughts on this Sir Lou? My mistake, the “La Madre Filipina” is on the Post Office side. Hi Sir Lou it’s me again. On a chance whim I googled “La Madre Filipina”, and discovered two blog posts about the Jones Bridge Filipina sculptures which are new info to me. This post by South Bike has a picture of a (slightly ruined) model for one of the scupltures that originally stood at the Plaza Moraga end (viewer’s left) and was relocated at the Court of Appeals (viewer’s right). This post by I. R. Arenas has detailed pictures of the relocated Plaza Moraga sculptures (now painted bronze as if that would “beautify” it, and unfortunately unlike the La Madre Filipina, they obliterated the wide decorative base). Judging from the details, it looks like the left Plaza Moraga sculpture suffered some collateral damage during the Battle.